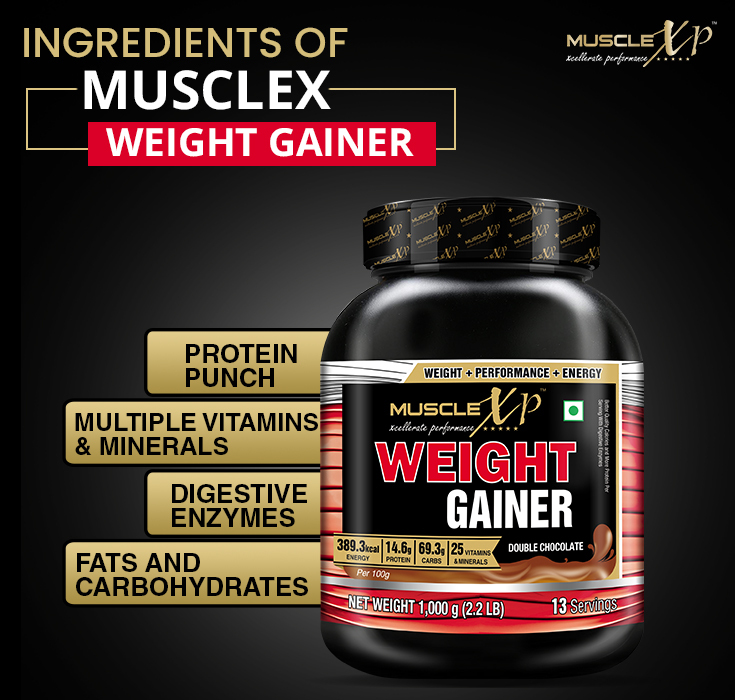 MuscleXP Weight Gainer contains a potent blend of proteins, vitamins, minerals, fats, carbohydrates, and digestive enzymes. Proteins are the essential building blocks of our bodies. They consist of amino acids and are an important structural component of muscles and other tissue. As supplements, proteins have become a staple of weight management programs, athletic performance, and high-intensity training. 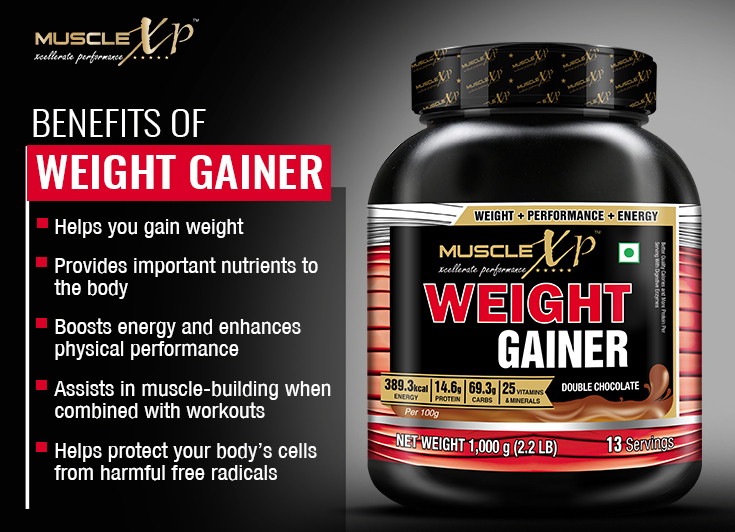 MuscleXP Weight Gainer contains Whey Protein Concentrate and Soy Protein Isolate. Whey Protein is derived from bovine milk. In concentrated form, it is free of water, lactose, and ash. It has a rich supply of amino acids and boasts of a high concentration of branched chain amino acids (BCAA) which play a crucial role in maintaining body tissue . Power of 25: MuscleXP Weight Gainer is loaded with 25 vitamins and minerals to ensure best nutrient intake as you gain weight. It contains vitamin A, vitamin B1, vitamin B2, vitamin B3, vitamin B5, vitamin B6, vitamin B12, vitamin C, vitamin D, vitamin E, folic acid and biotin. Among minerals, it contains potassium, phosphorus, sodium, magnesium, calcium, iron, zinc, manganese, copper, iodine, molybdenum, selenium, chromium. Benefits: The multi-vitamins and minerals in this supplement have a fortifying effect. Being organic compounds, vitamins help in regulating the metabolism of fats, carbohydrates, and proteins in the body. Minerals, on the other hand, are inorganic in nature and have various benefits for our body. For instance, magnesium aids in making protein and supporting the immune system. Iron promotes energy metabolism. Iodine regulates growth and development. Sodium aids proper fluid balance, and zinc is good for the health of the immune system. Men are recommended 1 to 2 servings a day. It is best to maintain an interval of 6 to 8 hours between each serving without adjusting the diet. This supplement can be taken as a mid-morning shake, evening shake, or even one hour before going to sleep to attain healthy weight gain. Women are recommended 1 to 2 servings a day, most preferably 2 hours after a meal. This supplement can be taken as mid-morning and evening shake. Maintain an adequate interval between each serving. MuscleXP Weigh Gainer is not recommended for children. This supplement does not have any banned ingredients. It contains sucralose and artificial sweetener. Allergen Information: This supplement has milk and soy ingredients. This supplement is not meant for medicinal use. It is not intended to diagnose, treat, cure or prevent any disease. Diluent (Maltodextrin), Skimmed Milk Powder, Diluent (Sucrose), Soya Protein lsolate, High Oleic Sunflower Oil (Fat Base powder), Cocoa Powder, lnulin, Whey Protein Concentrate, Calcium Phosphate Dibasic, Di- potassium Hydrogen Phosphate, Thickener (lNS 412), Sodium Chloride, Magnesium oxide, Sweetener (lNS 955), DigeZyme, Ferric Pyrophosphate, L-Ascorbic Acid, Zinc Sutphate Monohydrate, Beta carotene, dl-alpha Tocopheryl Acetate, Nicotinamide, Manganese Sulphate Monohydrate, Calcium D Pantothenate, Copper Sulphate Pentahydrate, Pyridoxine Hydrochloride, Riboflavin 5' phosphate Sodium, Thiamine Hydrochloride, Potassium lodide, Sodium Molybdate Dihydrate, Chromium Trichloride Hexahydrate, n-pteroyl l-glutamic acid, Cyanocobalamin, Sodium Selenite Anhydrous, D- Biotin & Ergocalciferol. Taking this product for healthy weight gain. Tastes delicious. Providing me extra calories between meals. Easy to digest. A tasty supplement for consuming extra calories for healthy weight gain. This is part of my daily diet for the last one month and it is helping. The extra calories I need to attain my desired body weight is coming from this product. I am taking this in addition to the regular meals. This is easy to make, tastes good and easily fits my diet plan. This is not only helping in healthy weight gain; it also helped in boosting my energy. For one serving, add one heaped scoop of MuscleXP Weight Gainer to 200-250ml of milk or water and shake it vigorously using a shaker or blender to get a rich, creamy, yummy protein shake.On the recommendation of a health-care professional, you may even opt for a heavy intake by adding two heaped scoops of this supplement in 500ml of milk or water.